When browsing the Internet, you’ll find hundreds of articles where authors claim they know how to help to increase the list of your subscribers with improved email marketing strategies. Most of the time, they all give pretty good tips. But there’s one problem: these articles give you ways to increase the list of subscribers, but there’s hardly ever any effective output. You don’t get feedback and your marketing emails go to spam. Experienced marketers will tell you for sure that the success of email marketing is in the list of your subscribers. However, there’s one big secret most never mention: quality. When thinking about increasing the list of your subscribers, you shouldn’t go after the quantity, you should pursue the ways of making your subscribers more loyal. Even 10,000 loyal subscribers can bring you more revenue than 100,000 email recipients. But how can you attract more of your kind of people? Which tips really work when it comes to increasing your email marketing list and bring along loyal subscribers? Keep reading, as I’ve got you some practical tips that really work. People, who’ve been doing business for quite a while, know that attracting new customers (in our case – subscribers) is not easy. That’s why they try to identify what their customers would like to experience and build their marketing strategies according to the needs of their customers. What is a customer journey? To put it a few words, customer journey (or customer experience) is a result of the interaction between a customer and a company. Customer journey is built on the long-term relationship and includes a customer’s experience using company’s products and company’s ability to fit the needs of a customer. But you wouldn’t call it a journey if it didn’t include clear steps. On the infographic above you can see five essential stages of modern customer journey and tools, with the help of which these stages are usually implemented. If you incorporate the initial four stages wisely, customers will share their positive experience and become loyal brand followers. It’s crucial to take the needs of your subscribers into account and to anticipate their feedback. Customer journey has already become a cornerstone of modern-day marketing. According to a Walker study, 86% of buyers want to pay more for better customer experience. Moreover, by the year 2020, it is anticipated that customer experience will become the key brand differentiator. Shift the focus of your marketing emails to a more personalized approach. Your subscribers value their positive experience, and your goal is to make it even more enjoyable. It’s not about how much information you put into your email, it’s about its originality and creative thoughts. In the 21st century, it’s hard to impress anyone, and even more effort is needed to impress potential subscribers. That’s why more and more companies opt for interactive emails. Take a look at an email by the company Brit+Co. This is a perfect example of an interactive email, which not only has a clear offer to the subscribers but also is coordinated with the style of the company. It is very important to introduce your brand in every marketing email you send. You should create emails in a way that will differentiate you from other companies and help your subscribers recognize your email from tons of other promotions they get every day. Being loyal to your brand and its features will attract more loyal subscribers. Subsequently, you’ll get more feedback and then – an increase in mailing list size as a result. BUT: With a great number of tools to make email content more creative, it’s very easy to over-indulge and use too many features. As a result, it will take longer for an email to download and it’s unlikely that a potential subscriber will read it. There’s a special concern regarding the ‘overweight’ marketing emails and smartphones. According to Impact, people spend 69% of their time using smartphones. That means that the probability that they read all of their emails on a cellphone is higher than you think. 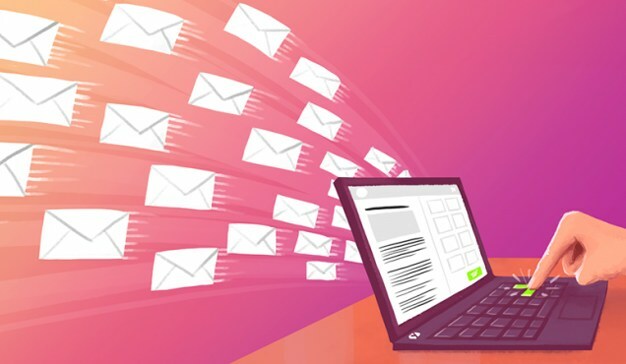 If a marketing email contains too many animated features and call-to-action buttons, there’s a chance that it will hardly open on a smartphone. *Make sure that your email is not too long. *Decrease the size and number of images. *Add a text version of the email. *Use brief subjects and a simple email layout. And as for the call-to-action buttons, it’s enough to include a couple of buttons with essential links, plus links to your major social media accounts. If you have a solid army of loyal subscribers, it’s time they shared their positive experience with other people. When sending an email, encourage your subscribers to share the message with their friends or relatives and offer them something in return. While encouraging your subscribers to spread a good word about your company is always a good idea, there’s also a way how you can do it even better. If you want to be really successful with this method, send these emails primarily to those who’ve already bought your products or used your services. This is a highly-targeted tactic, which works every time. Hundreds of people browse your website every day in search of content and information. They might not be your subscribers and might have never used your products or services. But if they do like your content, why not turn them into your loyal subscribers? An exit pop-up is a window that appears on your website after a few seconds. If the visitors of your website like your content, they might be interested in getting frequent updates about the latest news and updates about your products. Adding an exit intent pop-up is a great addition to your website. According to Sumo, pop-ups often have more than 9% conversion rate. So this is a good way to attract the attention of a visitor. But there’s a rule to it: let your visitors read your content for at least two minutes before an exit message pops up. It’s useless to offer a subscription when a person hasn’t even seen the content. Using QR codes is the latest trend in marketing. QR codes are on the rise and it’s clear why: they give instant access to the necessary information. The QR (Quick Response) symbols include a URL, which links you to the desired web page. QR codes get used everywhere, so why not include them in your emails? Consider the situation: your subscriber and his/her friend are having dinner together. Your subscriber gets an email which he or she wants to share with a friend. Instead of going through a tiring process of copying the link or re-sending the message, the friend can just scan a QR code and get an instant access to your website. It’s easy, effortless, and contributes to the positive customer experience. Building the relationship with new subscribers is a process that definitely takes some time and commitment. Be patient and attentive, take interest in the needs of your subscribers, analyze their feedback and improve. The more attentive and caring you are, the more loyal subscribers you’ll get.